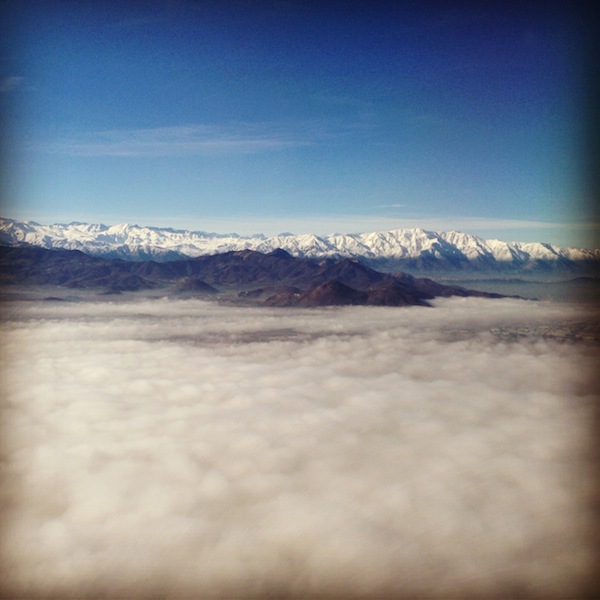 There’s something awe inspiring about flying on a plane. 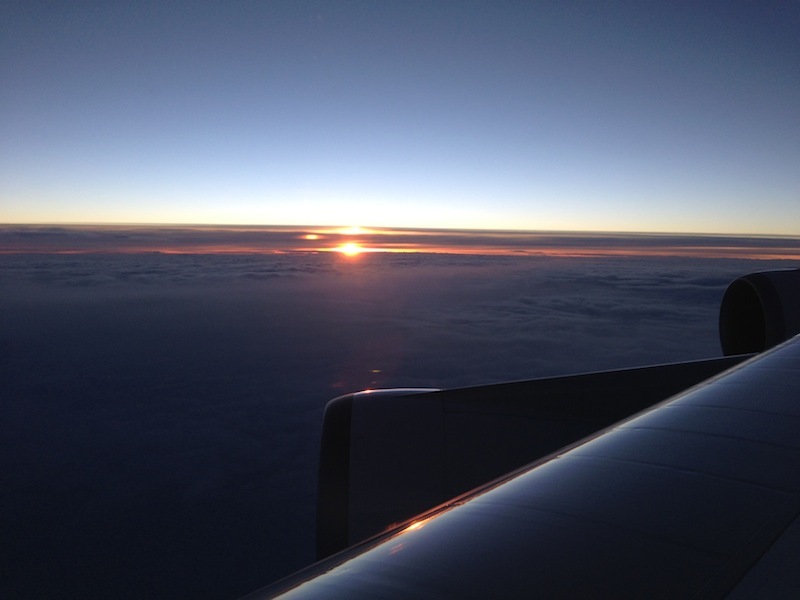 I love it and have been travelling on planes since an early age. Even after the hundreds and hundreds of flights I’ve taken in my life, I still get a buzz of excitement when boarding a flight and holidays to me never feel like a proper holiday unless I’ve flown there. 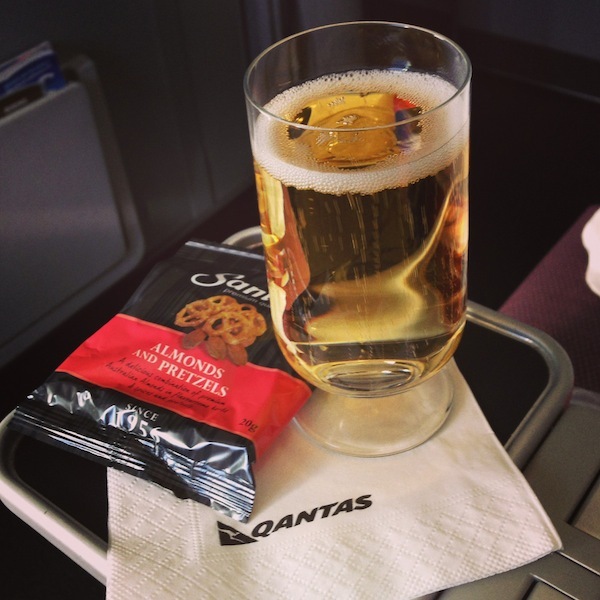 For my trip to Argentina, I was excited to be flying both domestic and internationally with Qantas. When in NZ or the UK, I usually flew Singapore Airlines or Air New Zealand whenever I travelled overseas. But as I’m now living in Australia I was looking forward to trying out my ‘local’ airline and seeing how they compared. My journey was going to be a long one – Melbourne to Sydney, Sydney to Santiago in Chile, and finally Santiago to Buenos Aires in Argentina. A whopping 27 hours door to door on the way out because of a long stopover in Santiago, and a slightly more respectable 22 hours on the way home. Over the last few years I’ve flown in Business class or the equivalent on my of my flights and once you’ve experienced the high life it’s hard to go back. So I was very lucky and very happy to get an upgrade for my international flight from Sydney to Santiago, and also Qantas lounge access in Sydney. My domestic flight from Melbourne to Sydney was in economy, which I don’t mind for short haul flights. The seats were comfortable and there was plenty of legroom, which is a big bonus for me as I have long legs. I’d pulled an all-nighter packing and sorting out last minute bits for my trip so was pretty much asleep before we even took off. I crashed and burned and even managed to miss breakfast. My first memory is of being gently woken by the stewardess who told me we were approaching Sydney, that we’d been delayed because of the fog over the city, and that she was moving me up to the front of the plane into business class so I could leave the plane first and hopefully make my connecting international flight. Air stewardess on Qantas Flights. 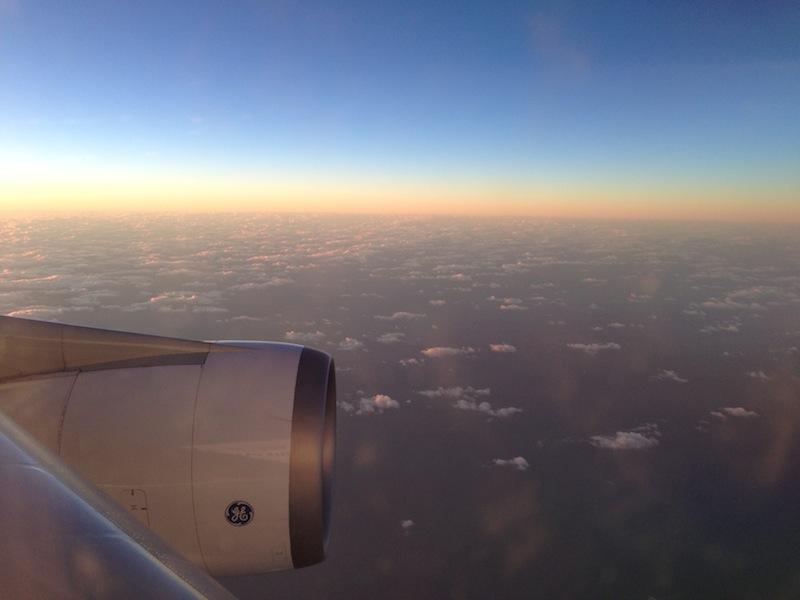 Photo from Qantas. 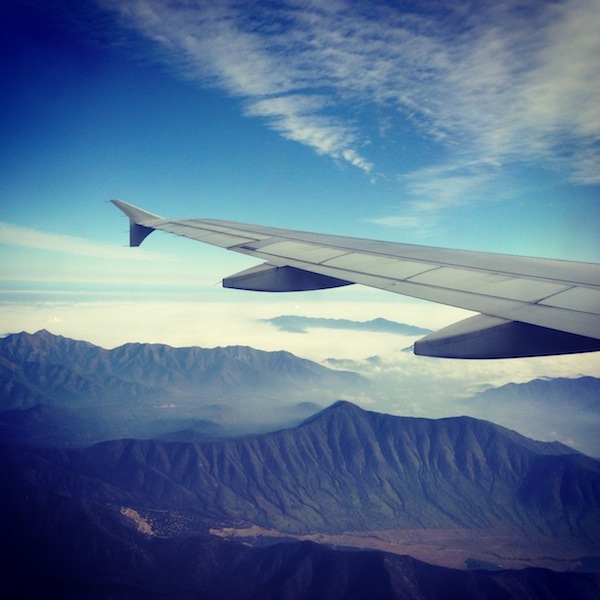 I was totally impressed with the fact that she knew A: my name (usually only reserved for those in Business Class) and B: that I was going international had very little time to get to the international terminal to make my flight to Santiago. Somehow by some divine power we all managed to make the flight, which thankfully had been delayed by the fog too. In the rush, I didn’t have time to make use of the lounge, which was a shame as I was somewhat flustered and disheveled by this point, so it would have been nice to take a few minutes to calm down and prepare for my long haul flight. I’m definitely one of those people that appreciate the finer things in life and I also appreciate good service especially on airlines. When I boarded the plane and the crew had directed me to my seat in Premium Economy, I was greeted by name by the steward and brought my glass of bubbles to enjoy whilst the rest of the passengers were boarding. I sat there somewhat smugly, sipping my champagne, watching the masses file past me back into cattle class. Premium Economy Seats on Qantas – I had a spare seat next to me on all my flights, but I wouldn’t have minded sitting next to this guy! Photo from Qantas. Qantas Premium Economy is definitely a step up from some other airlines. On my Trans-Tasman flight from NZ to Australia, I flew Business Class with Air New Zealand and was unimpressed with the size of the seat. After the trays, TV and the other gadgets had been squeezed in it was cramped to say the least, and I felt like I was sitting between a vice. On Qantas however, there was plenty of wiggle room and the seat was definitely a lot more comfortable. I also loved the headrests, which you could pull forward and back from either side to rest your head against. My only complaint would be the footrest, which didn’t really serve a purpose. It needed to extend out just that little bit more to get my legs at a higher angle to be really comfortable especially when sleeping. One of the great things about travelling in the higher classes on flights is the food and drink selection, and Qantas was no exception. When I got to my seat, I was handed the menu for the flight, which gave me all the options I had available. On the way there it was lunch, snacks and then breakfast, and on the way home it was lunch, snacks and dinner. The choice of food and wine was excellent and the refreshments and snacks in between meals were really tasty too. 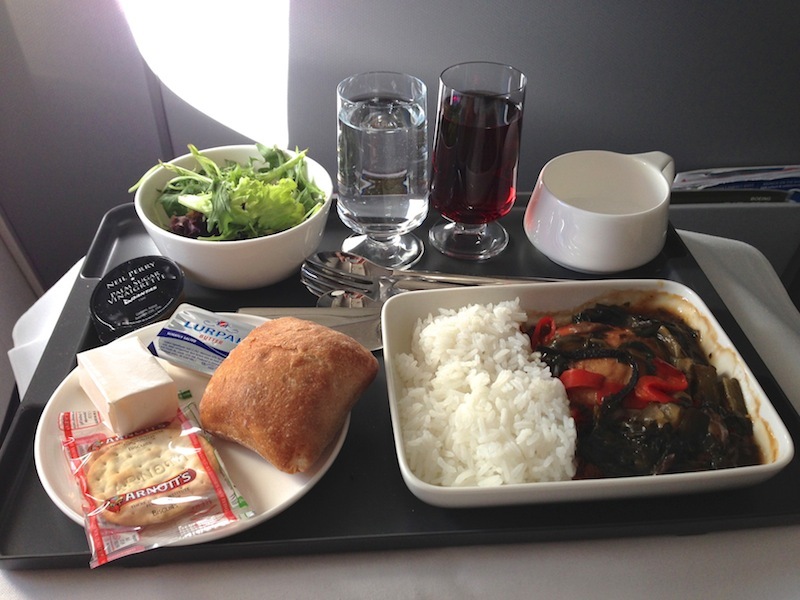 On my Sydney to Santiago flight I had the salad of garden leaves with chardonnay vinaigrette, the Chinese style braised chicken with shiitake and cucumber, and jasmine rice, cheese and biscuits and mango ice cream. I didn’t try many of the snacks apart from the dark chocolate bar and the amazing pistachio amaretti which I am still dreaming about. They were possibly the best biscuits I’ve ever tasted. They melted in your mouth and I could have eaten a lot more of them than I did! The breakfast was a really yummy warmed muffin, seasonal fruit salad and cereal with a cup of Earl Grey tea. On the Santiago to Sydney flight for lunch I chose a green leaf salad with balsamic vinaigrette, a mushroom panzerotti with cheese sauce and sun dried tomatoes followed by cheese and biscuits. Dessert was a Dulce de Leche Haagen Dazs Ice Cream which was pretty fantastic. For the snacks mid-flight I had the gorgonzola and radicchio pizzetta with rocket salad and the walnut and cinnamon biscuits with my Earl Grey tea (good but not as good as the amaretti). Dinner was the only let down. I was really looking forward to having the grilled salmon with lemon butter, roasted potatoes and seasonal vegetables for dinner, but so did everyone else apparently. So by the time the stewardess got to me they had run out of it. She did offer to bring me the fish dish from Business Class but it was a spicy dish, which I can’t eat. So instead I had the green leaf salad with capsicum and parmesan, and instead of the salmon, the roast chicken with a shallot and garlic sauce, tomato rice, and green beans followed by an orange cream cake with raspberry sauce. I’m not sure whether it was because I’d had my heart set on the salmon for so long, but I didn’t eat much of the chicken dish, as it wasn’t hitting the spot. On the plus side though, because I had a very short amount of time to make my Sydney to Melbourne flight, I was very kindly upgrade to Business for this and I managed to get a beautiful salmon and beetroot salad on board which made my day, and quelled the urge for the salmon I’d missed out on. The wine selection on the flights was fantastic and it featured some beautiful Australian wines, and also French Champagne. My favourite was definitely the champagne, which was the Billecart-Salmon (I think I might be anything salmon mad!). I tried some great red wines on the flights too, but unfortunately I didn’t see the bottles for these so am not sure what they were. In flight I was provided with really good quality headphones to watch all the movies with. There was a good choice of movies, although not many new ones out at the cinema but I still found plenty to keep me entertained on my flights. I was also given a blanket which was really warm and cosy which was fantastic as a lot of airlines have stupidly thin blanket that don’t keep you warm. There was also a really great pillow which was surprisingly comfy. The inflight pack contained a toothbrush and toothpaste, an eye mask and some socks to wear on the plane. I was lusting after one of the Kate Spade packs that the Business Class passengers get, as I love her bags, so hopefully one day I might be able to get one of those. Unfortunately I didn’t get to try out the Qantas lounge on either the outbound or inbound journey. This was the fault of the travel agent who booked my flights though. My connections times were ridiculously close together, so I spent most of the time trying to clear customs, or running around the airports from one gate to the next trying to make my flights on time. Luckily I didn’t miss any, but it meant I lucked out on getting my pisco drink from duty free in Santiago, which I was upset about as I arrived only 30 minutes before the flight to Sydney left. As it was under an hour to departure, it meant that the duty free was closed for me. This is because for flights to Australia, they put the duty free in the luggage hold due the restrictions on carrying liquids on board the flight, and you collect it when you get off in Sydney. One great thing though is that Qantas have just recently reduced the fees for booking online and paying with a credit card, which is fantastic, and I hope this sets the scene for other airlines to follow. All up I had an amazing trip on the Qantas flights and they are definitely on my favourite airlines in the world list now. The cabin crew were incredibly professional and friendly, and didn’t mind at all making me numerous cups of Earl Grey, and in fact the stewardess just brought me one when I woke up on one of the flights which I thought was a really great touch, and was much needed. I have also now accumulated a fairly decent amount of frequent flyer miles. Although no way near enough for an international flight, it might get me a flight or two around Australia so I can discover more of this great country. I would definitely recommend flying Qantas, and I myself will definitely be flying with them again soon. 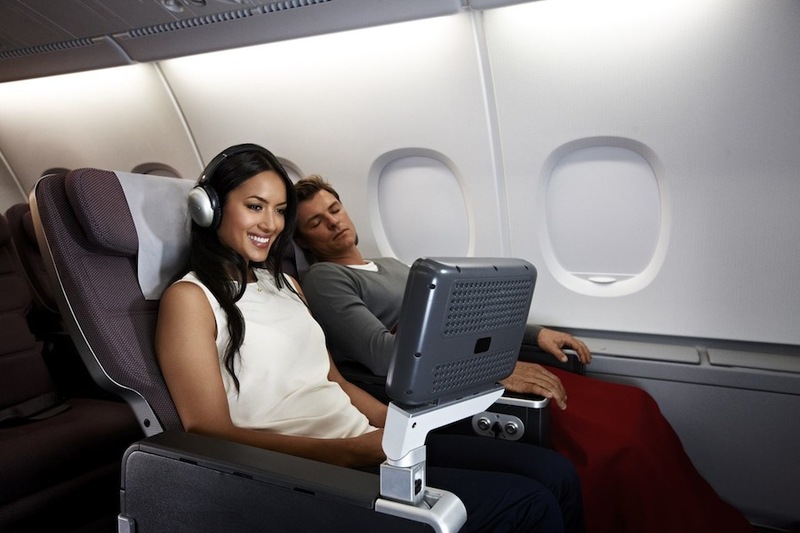 I am yet to try Premium Economy on any airline so it’s good to hear that there is some wiggle movement and extra amenities that make it worth the upgrade! Hi there! I found your blog via TBEX. I really like your post about Qantas. I’m not usually a Business Class flyer (sigh! ), but I have been upgraded to 1st Class by British Airways once, years ago. It was short-haul from Berlin to London but it was one of the happiest days ever and I still have the menu!